Cafe Claude is in the same alley as Gitane. This may be the most delicious alley I've ever encountered. 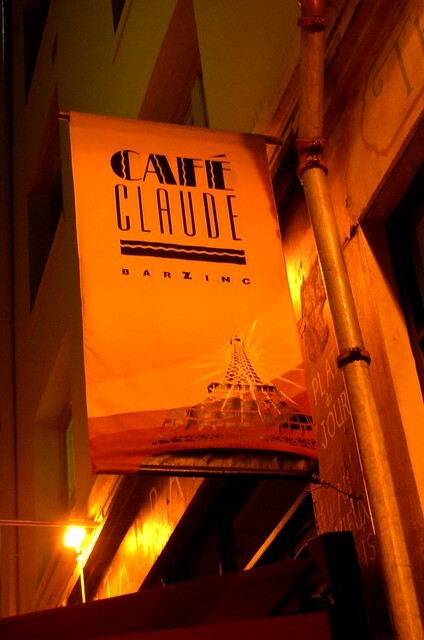 Having just gone to Paris last month, we still had the food fresh in our memories, so it was going to be hard for Cafe Claude impress us. But it did! Granted, it wasn't Paris, but it was rather delicious! Just pretend we got swept away to the 1920s like Owen Wilson did in Midnight in Paris...when color photography wasn't rampant. 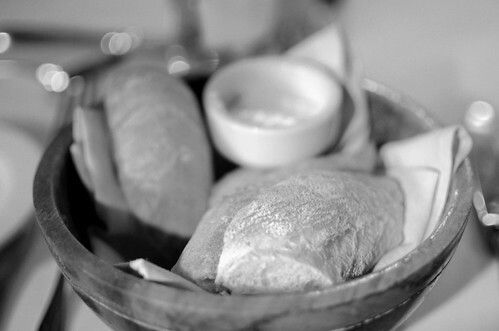 Who can resist a warm and crusty baguette? 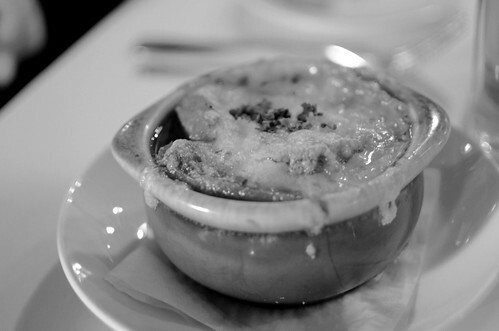 Soupe a l'oignon -- onion soup gratinee with Swiss cheese, baguette croutons ($9). Really nice version. Super cheesy. 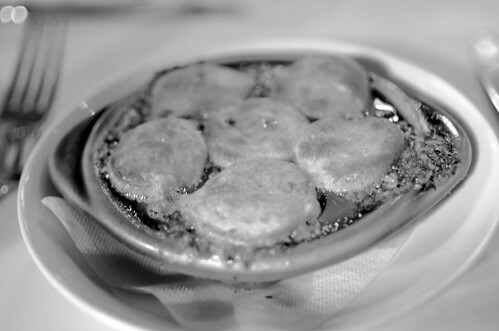 Escargot en croute -- garlic, butter, parsley, almond, pernod, shallots, anchovy, puff pastry ($11). We love snails! Butter, garlic, and puff pastry could convert anyone! Coq au vin -- chicken marinated in red wine, bacon, mushroom, pearl onion, fingerling potatoes, roasted carrots ($22). 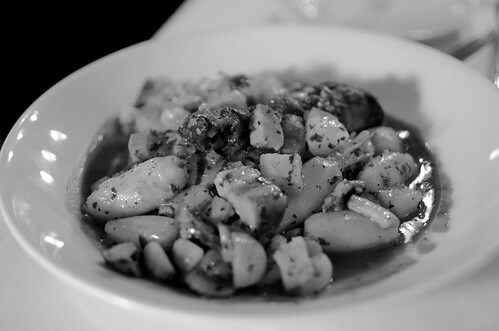 So wonderfully tender and completely steeped with wine. Happiness. Epinard -- sauteed spinach ($6). I ate almost all of this! Poor Mr. Monkey! 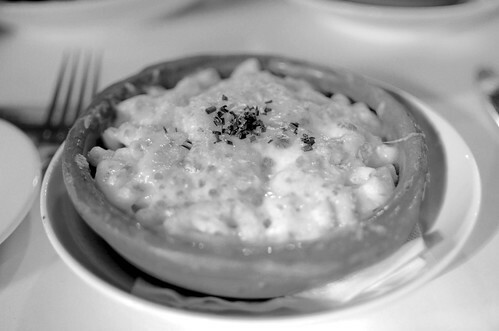 Macaroni gratinee -- Emmental cheese, shaved truffles, herbs, bread crumbs ($12). But Mr. Monkey ate most of this. Fantastic. Sorry for the ridiculous black-and-white, but I couldn't just dump these photos. This meal was worth sharing with you. I completely forgot about this place! 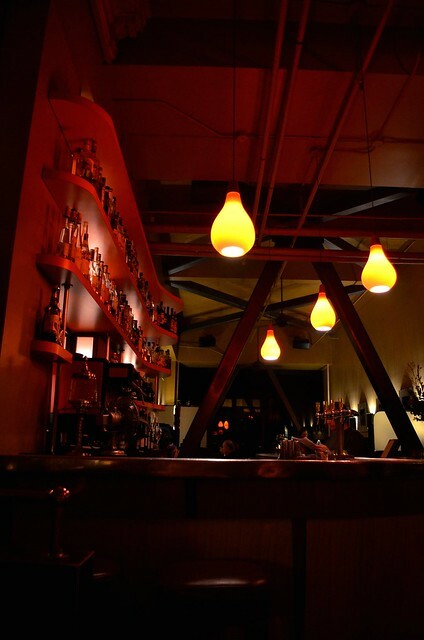 I ate here about five years ago and I too had the coq au vin and the onion soup, both of which were wonderful. Thanks for bringing back some good memories! seeing the photos in black and white is like weezermonkey: unplugged. I used to work nearby and regret not going there more often. Love that soup. 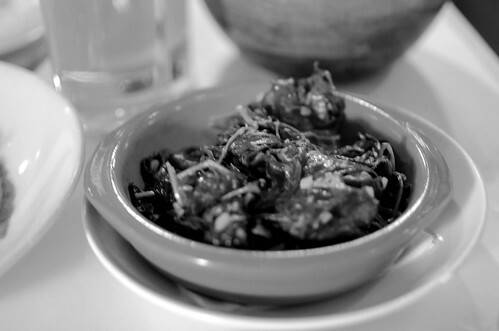 food photography in black & white! so avant garde. i need to visit that alley.